Oh my goodness I actually got a little sleep last night. I’m in shock this has not happened to so much time. I am at day 12 of my Chemo cycle now and am beginning to feel human again. As many wise women have told me I need to be careful of being romanced by the idea of my energy returning. Many amazing women who have walked this road before me have shared with me that I need to prioritise my rest. As many of you may imagine, this is one of my biggest challenges. I am not used to pacing myself, pulling myself first, being kind to myself, being patient with myself. This is like a new language I am yet to learn. As I have shared previously, I do believe this experience has come to teach. This is how I choose to look at my circumstances and take the gifts from it. One such gift I believe will be for me to learn how to be kind to myself. For me to learn how to give back to myself and how to fill my own tank. I believe God has been trying to teach me this for many years, however I am as stubborn as a mule. I think it has taken the road of cancer and a complete and utter destruction that comes with chemo to bring me to my knees. And on my knees I am. An exciting thing that’s happening today is a new piece of furniture is being delivered. We bought what is called a snuggle chair this beautiful chair that is round, comfy and fits 2 people. Romantically, I think Marc and I had visions of us sharing this chair while we chatted, read the books and just spend time together. 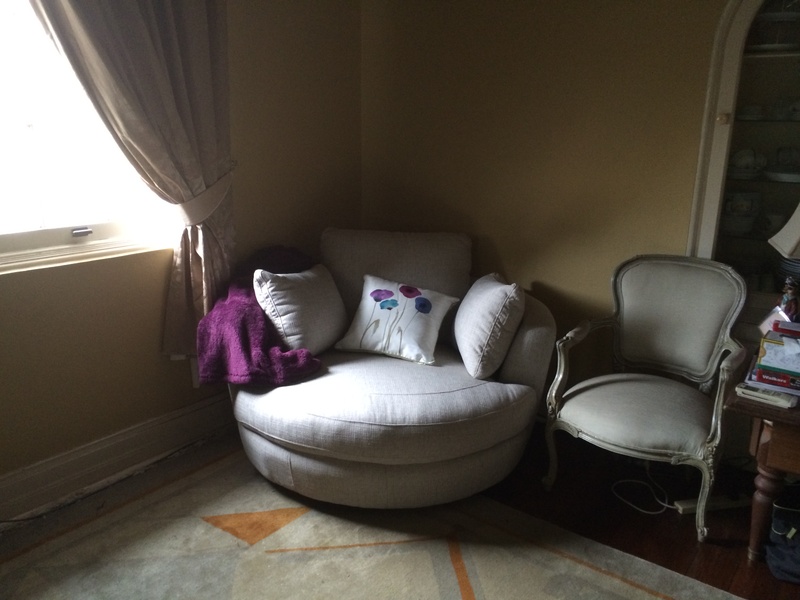 See the picture above, this is the chair in our lounge room. The current unfortunate truth, is that each time I am near him I have so many hot flashes that I cannot really be near him. What a sad story this is. Again my to-do list is longer than my energy levels. After church this evening we head home and I am completely whacked. I really need sleep. I also really need to get this lesson and start resting regardless of how I feel. I need to be proactive not reactive. One day it will sink in. Thank goodness my God is so gracious and patient with me. This is a quick apology to explain why you have not heard from me in a while. I think it is 10 days now. We have been on holidays and it was great. I began learning to surf, I have a whole new respect for the ocean and for anyone who is able to get upright on a board! Whilst away on our idyllic holiday my computer was infected with a virus and also my email was hacked. Two separate incidents apparently, but as such I was off-line until the issue was fixed. I had planned to keep in some contact during my break but good my intention was foiled! Life can be confronting and scary enough without people breaking into your private – cyber life like that. I felt violated in some ways. I was unable to use the internet in case my key strokes were being recorded. My business and private emails were hacked which meant key people and colleagues got very weird messages from me and if they clicked on the link may have been infected also. So please if you ever get a weird email from anyone don’t click on the link!!!! Even if it’s your Mum! It has been a very eye opening experience. But I am back on line and will post to the blog tomorrow. I will be starting something a little different this year and making one post each week purely about resourcing you. Whether you have cancer, know someone who has or just want to be really healthy I am sure this will be of benefit and interest. If there is something in particular you would like me to cover or share please comment and let me know, I’m an awful mind reader. Until then please take care, HAPPY NEW YEAR to you all. To your best year yet! I slept ok, better than expected without medication. I wake feeling tired but ok. Tiredness is a permanent state of being for me at this time, Lethargy s like a friend staying on my couch uninvited and I can’t get the to leave. Marc is out doing some errand and I begin to do some chores. It is not long before I realise I need to return to bed and sleep. The pain in my hip is unbelievable. I eventually fall off to sleep and wake at 3pm, I feel so hot it is like I am on fire. I have my own personal light bulb moment and realise we have a pool! Eureka!!!! I go for a swim and oh my gosh it is so nice…… I float around I my own cool bliss. I am not sure what it is but because I am so flat I am craving carbs something ridiculous. All I eat is chips, chocolate and liquorice. The only thing that tastes semi normal is liquorice. It is the only thing that can cut through the permanent metallic taste in my mouth. Because I have eaten such crap all day I feel really bad by late afternoon. A combination of bad food and guilt has me crippled. I need to just crawl like a bad dog into bed and hide away. I want to leave today, start fresh tomorrow; I hope my body will allow me to. Part of this is me learning to allow myself to have a bad day, a slow day even a nothing day. I am so achievement oriented and this journey is sometimes full of me achieving nothing except having a day like today eating crap and then feeling sick. I woke at 1am and was wide awake until 3am. It was a combination of being too hot (internally, hot flushes) and being in too much pain. I got up and walked around for a little while. These wee hours of the morning can be such bliss and peace or the exact opposite so horribly quiet and lonely. The time passes so bloody slowly and every bad feeling or emotion seems magnified. I am always so glad when the sun rises fem these nights. Today we had vision Sunday at church. This day is always so inspirational, it lies out the vision over our church for the next 12 months. The vision spoken over this year is a year of new beginnings. This could not be more true for me and my family. So many things will be new this year, Sam is growing as a young man, Moni is doing the HSC. Me, well I am just trying to find my new normal. Marc is balancing so many things and being the rock for us all. This year will hold many mysteries, many challenges, many opportunities and much growth. Physically I am in less pain today but I am still dog tired. 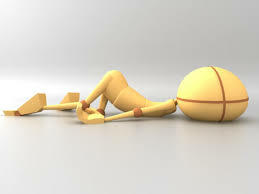 It is really hard to put into words the gravity of this tiredness. I still don’t really even understand it myself I just know I have no control over it. Despite being so tired today was a big day. There was little rest, and many errands to be done. Anyone else reading this who has a family knows exactly what I mean. Today simple things like the ironing, the shopping, the washing, general organisational stuff all that needed to be done. I know some of you reading this may be saying, “Why doesn’t someone else do it?” The simple answer to that is, “Who?” Yes, we have had so much support, it’s almost overwhelming. However, these people have lives to lead too. Additionally, one thing I’ve always struggled with is asking for help. So this day may take its toll tomorrow only tomorrow will tell. I’m so desperately tired but I can’t sleep. At midnight I decide to take sleeping tablets I just need to sleep.